Today MarketingSherpa’s Email Summit started in Miami. It is focused on advanced email strategies, which is an important part of the demand generation process. Most of the case studies seem to be B2C rather than B2B. The focus is on list- and trigger-based emails and on landing pages, rather than on the full Lead Management Automation functionality. Nevertheless, there are lots of interesting advanced email topics that are just as relevant for B2B demand generation specialists. Unfortunately I can’t be there, but there is live coverage via Twitter. This entry was posted in Email Marketing, Landing Pages & Forms and tagged database segmentation, email analytics, Email Marketing, email testing, events, landing page optimization, marketingsherpa, personalization on March 15, 2009 by Jep Castelein. Today Genius.com launched their new Genius Enterprise product. It adds automated lead nurturing, real-time lead conversions, and lead scoring to its existing email marketing solutions. Genius.com is well-known for its sales notification product, SalesGenius. It allows sales people to send personalized emails to their prospects and monitor their response in real-time. The Genius Tracker – sort of an instant messaging client – gives immediate alerts if prospects visit the company’s website. 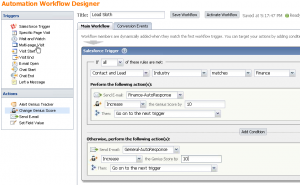 Sales people can sign up individually, without having to involve the IT department. Last year Genius.com introduced MarketingGenius, which allows marketing departments to send emails on behalf of the sales people. Again, the responsible sales person is notified of click-throughs via the Tracker. The Enterprise product that is launched today extends this offering with lead nurturing and lead scoring. Now Genius.com is one step closer to becoming a viable competitor to more established marketing automation solutions, so I’ve added them to my list of Demand Generation systems. 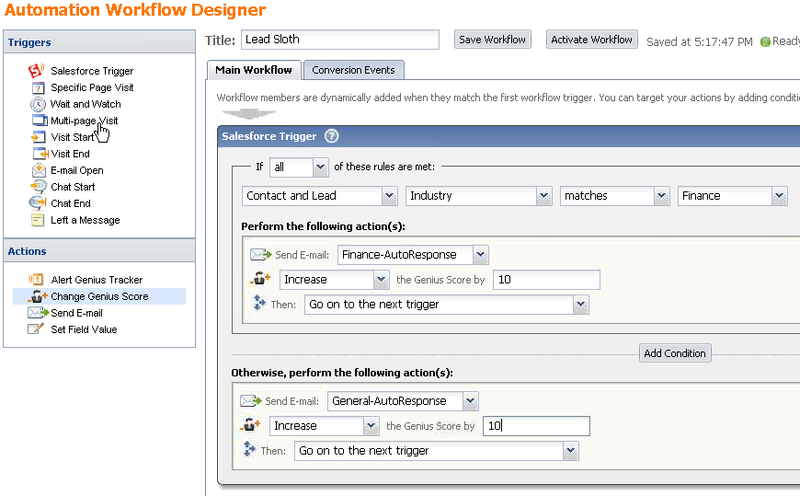 The screenshot shows that many events can start a workflow: a change in Salesforce.com, a website visit, an email open or the passage of a certain amount of time. Based on that, additional emails can be sent, the lead score can be updated or the responsible sales person can be alerted. For a more detailed review, see David Raab’s write-up. Genius.com expects that this product will especially appeal to mid-side to large organizations. Most will use this together with the SalesGenius product. Pricing starts at $18,000 per year, including 5 SalesGenius seats. How does Genius Enterprise Compare? Many new customers will upgrade from Email Service Providers that don’t provide the real-time tracking and lead nurturing features. The closest competitor in this area may be ExactTarget, which offers email nurturing functionality. If your first priority in Demand Generation is to make better use of email campaigns to nurture prospects, and to foster sales & marketing collaboration, Genius Enterprise is an excellent choice. If you need other demand generation features like landing pages, you should compare it with full-featured demand generation products. PS. Genius.com will be at the Sales 2.0 conference, this Wednesday and Thursday in San Francisco (4 & 5 March 2009). Stop by for a demo. This entry was posted in Demand Generation, Email Marketing, Lead Monitoring and tagged Demand Generation, Email Marketing, genius enterprise, genius.com, lead nurturing, lead scoring, marketing genius, salesgenius on March 2, 2009 by Jep Castelein.